Last night we were surprised so see rumours of the death of a second lion, Jericho, circulating in the media – we had no evidence for this. The rumours claimed he too had been hunted illegally. The WildCRU field research team and a National Parks ranger set out at daybreak to attempt to find him. People will realise that even with the aid of tracking equipment, this is difficult and skilful work in remote bush. Andy Loveridge contacted me moments ago. Jericho was seen alive and well at 06.15am. 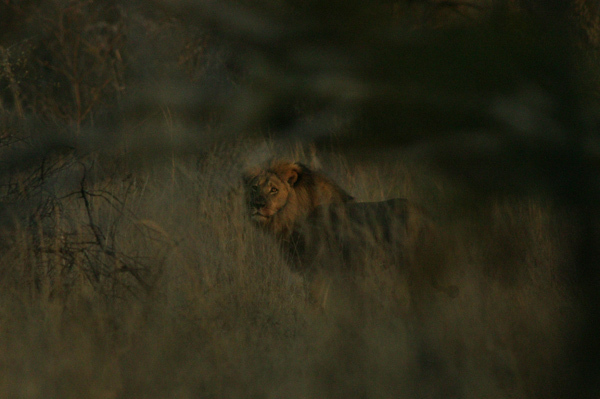 He has been feeding on a giraffe kill with the lionesses from his pride. Jericho is large male lion, about 11 years old, who has been intensively monitored as part of our detailed study of lion behavioural ecology in Hwange National Park. WildCRU’s Brent Stapelkamp was able to get the attached photo of Jericho. Many people have asked if Jericho and Cecil were brothers. They were not related though their bond was one close to brotherhood. Male lions often form what are termed co-operative ‘coalitions’ with unrelated males in order to better compete with other males for territories and prides. In fact 42% of male lion coalitions are genetically unrelated, though larger coalitions tend to be brothers or half-brothers. This sort of detailed understanding of lion ecology and social behaviour, which takes years of meticulous work allows conservationists to devise the most appropriate conservation strategies to conserve these iconic cats.